I've been reading a writing guide that I found in a second-hand book shop. It's called, 'Writing begins with the breath,' by American writer, Laraine Herring. It caught my attention for two reasons. Firstly, it explores how both your mind and body are more disposed towards writing through the practice of yoga. As a trained yoga teacher, this immediately appealed. Hurrah! I thought. A short-cut to the muse! And secondly, naturally, it's a book about how to write. Hurrah! I thought. A short-cut to the muse! I mentioned last week how Nick Cross talks on his blog about suffering from 'outcome-focus.' And it just so happens, that Laraine Herring – a creative writing lecturer - talks precisely about this enthusiasm of her students to find out all about agents and publishing deals, way before they've actually sat down and written anything worthy of submission. The irony of reading about people like me, in a 'how to write' book – rather than sitting down and writing, is not lost. Then there are all the books to read written by great children's authors. The stellar stories of their success. And competition deadlines to line up like rubber ducks. These activities are all undeniably valid and useful, inspiring and informative, but they don't get me any closer to sitting down and writing my own stuff. This is where I need a brain that can switch between actions and thoughts, with no bleed and contamination in between. Because reading around the act of writing IS good for the creative spirit and mind – just not so good if it out-shadows the actual knuckling down to JFDI (a short and sweetened version). One thing I am actively doing, is writing three Morning Pages, every day. This is a long-hand, stream of consciousness writing recommended by another American writer, Julia Cameron. Morning Pages are a clearing process, a way to not only set out your intentions of the day, with the understanding that if you've written them down they will be all the more easy to fulfill – but also as a way to unravel hidden thoughts and dilemmas. I've kept this up every day of 2015, not always in the morning, but it has acted as a life-line in terms of my writing. I might write the biggest load of drivel, but it has also produced some small shiny gems that I never knew were there. On a continued procrastinating note, this is what I unearthed when I googled: 'What's happening in the world of children's Books 2015.' I discovered a veritable treasure trove. Plenty on which to feast your procrastinating eyes! 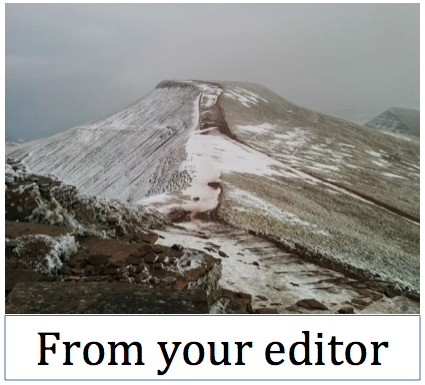 NB: The photo above is Pen-y-fan - the mountain I successfully found and climbed on Thursday (following a failed attempt 3 weeks ago). A healthy example of compartmentalisation - how to fixate on climbing said mountain, and JFDI. In lieu of yoga, walking the dog clears my head of FB, Twitter (and, dare I say it, daily dip into W&P) all of which significant parts of my personal procrastination ritual.